I am finding new and innovative ways to work with kiwi fruit. Some have been amazingly successful and others not so much. Yesterday I made some kiwi chips using my crisp maker and even though they tasted good, they did not look good! I slightly caramelized burnt the centres of each little crisp. I also attempted a ceviche, but I was not happy with the result. I then decided to make a cocktail. I am not much of a cocktail drinker but I would happily drink this again, maybe with a few variations as kiwi fruit is so good for you. 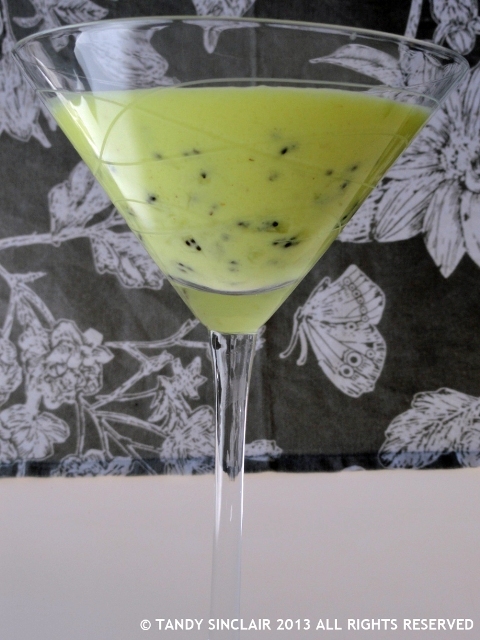 Using fruit or vegetables in cocktails is not a new concept and you will see how I used cucumber here to make a cocktail. What fruit do you like in your cocktails? Think I love you now! What a superb drink for grown ups! MMMMMMM! I can’t wait to try it out! A very grown up drink – and I have one more up my sleeve! Delicious fruity cocktail! What’s there not to love about this. yum! I love to spin fruit with spirits but making an infusion of concord grapes with rum has been one of my favorite. That sounds like a winner indeed! I love any cocktail with mango, peach, or mint! I shall have to make a peach cocktail soon for you then! Sounds great and looks so pretty too! I absolutely LOVE the combination of ingredients you have used here. I reckon I could drink several of these cocktails, no problem 😉 Great recipe. As I don’t really like the taste of Kiwi I’ll not be having those. But some years ago I had lavender and litchi cocktails and kept wanting to go back for more. That is so interesting – I could get into that!